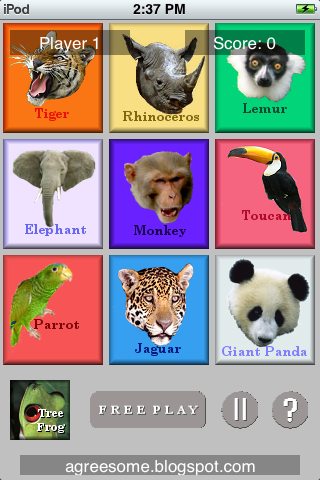 A sequel to our popular Kitty Cat Piano, Puppy Dog Piano, and Pretty Bird Piano games. Recreate the sounds of the jungles of the world on your iPhone or iPod, create a symphony of sounds and play it back to the amusement or annoyance of your friends. Brightly colored, and fun, this is the perfect time waster for children, or adults. 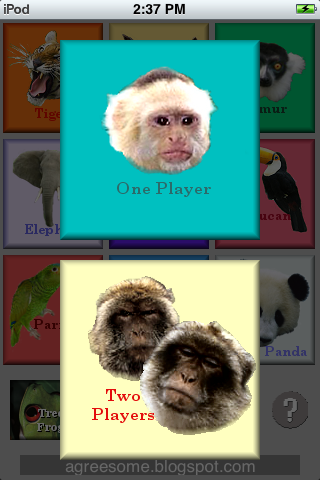 Play a memory-like game by yourself or with friends, and test your skills. This likable, fun program will be a constant delight. 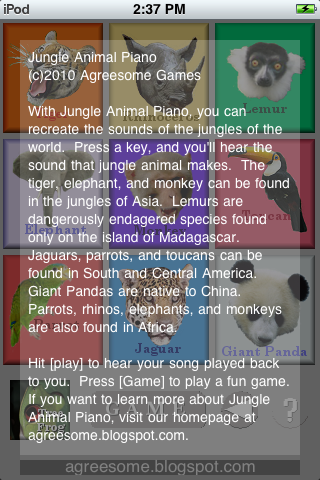 Featuring the sounds of the tiger, rhinoceros, monkey, jaguar, lemur, giant panda, tree frog, parrot, and elephant.